Epiphone is proud to announce the Wilshire Phant-o-matic. 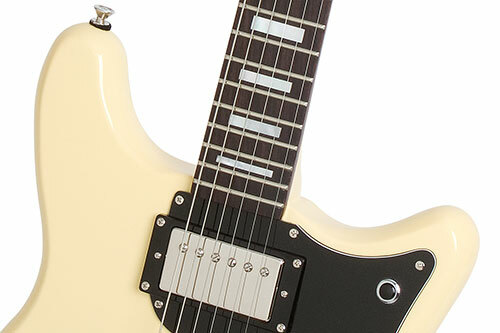 Designed in collaboration with Frank Iero, guitarist for multi-platinum band My Chemical Romance, the Wilshire Phant-o-matic combines an incredible array of features that only Epiphone would dare put in one instrument! The result is one of the smartest and most flexible guitars available with all the vintage styling that made Wilshire models a behind-the-scenes favorite for artists like Jimi Hendrix, Johnny Winter, Paul Gilbert, and Steve Marriott. Classic Form: Like our classic SG design, the Wilshire Phant-o-matic features a double cutaway design with a solid Mahogany body. The 24.75" scale Mahogany hand-set neck has a 1960s SlimTaper™profile, a Rosewood fingerboard with mother-of-pearl block inlays, a 12" radius, and a 1.68" nut. The neck profile and double cutaway make the Wilshire Phant-o-matic a perfect guitar for chunking rhythm or cutting leads. 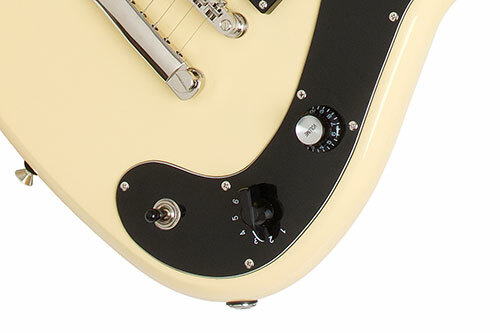 The Antique Ivory color finish, black single-ply pickguard, and classic form are eye catching to be sure. But what really sets the Wilshire Phant-o-matic apart from the pack is how it sounds. Video courtesy of Musician’s Friend. Look for My Chemical Romance and Frank with his Wilshire Phant-o-Matic on the cover of the October 2011 MF catalog. Premium Electronics: My Chemical Romance have sold almost 7 million albums worldwide. And with all their touring and studio work have learned a lot about what makes for a great, reliable, and cutting edge instrument. Frank Iero and Epiphone luthiers worked together over several years and prototypes to create an axe that puts the tone of a dozen different guitars at your fingertips. The result is what you make it. The Phant-o-matic can be a straight ahead awesome rock guitar or something completely new and groundbreaking. The choice is yours. 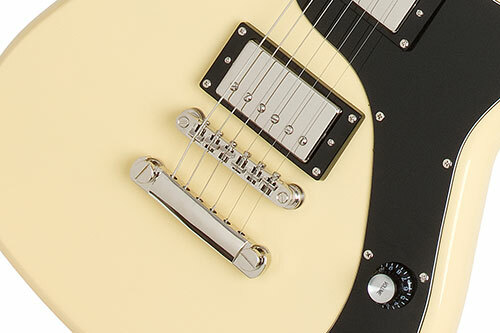 The Phant-o-matic employs two classic Epiphone pickups, our famous Alnico Classic Plus™ humbucker in the bridge position and an Alnico Classic™ humbucker in the neck position. To get the most of the wide tonal possibilities from these pickups, which are modeled after the original Kalamazoo humbuckers designed for Gibson by Seth Lover, we've included a mono VariTone™, much like the one used most famously by blues legend B. B. King. 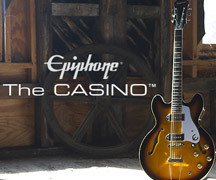 The Epiphone VariTone™: The VariTone™ uses a six-way rotary switch which engages 5 pre-set notch filters and a bypass. In position one, the VariTone™ is completely bypassed. But as you rotate the rotary switch into positions 2-6, the center frequency of the notch filter shifts from around 1.9kHz down to 130Hz, providing you with a wide tonal palette unavailable on most other instruments. Positions 2 through 4 offer more tonal shaping while still maintaining great clarity. As you keep turning, you'll find Positions 5 and 6 shape-shift the Alnico Classic™ humbuckers into sounding like a single coil pickup but without the thin quack usually associated with single coil pickups. Add it all up and between the 6-position VariTone™ circuit and the 3-position toggle switch, you have 18 unique tones available. And Epiphone has also included a high quality horn-mounted kill switch which provides an infinite range of staccato on/off effects. A master volume control is mounted with easy access to the VariTone™ rotary switch for quick adjustments. Other Premium Features: Like many of our classic solid body electrics, the Wilshire Phant-o-matic uses our LockTone™ Tune-o-Matic™StopBar bridge for tuning and intonation accuracy. Machine heads are nickel Wilkinson™vintage style tuners with green keys. 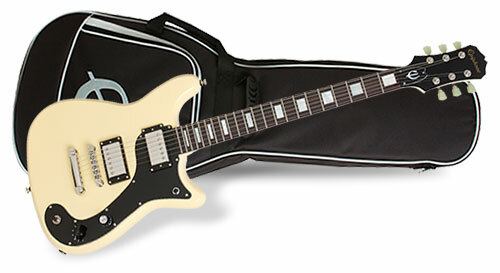 And to protect your guitar, Epiphone has included a premium, padded gigbag. Peace of Mind! 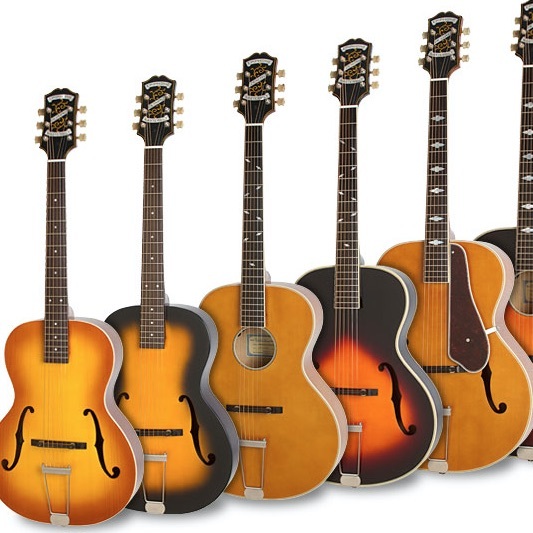 As with every Epiphone, every Wilshire Phant-o-matic comes with the peace of mind you get from our Limited Lifetime Warranty backed by Gibson's famous 24/7/365 day Customer Service. See and hear the groundbreaking Wilshire Phant-o-matic today!